CVTech SQ52-2188-C Drive Belt for CVT. GENUINE CVTECH BRAND. 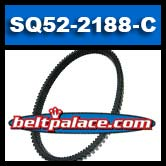 SQ52-2188-C CVT Drive belt: 2016 Dominator Side-by-side (Select Models- check belt number prior to purchase). OEM for LIANGZI POWER (ODES) SQ52-2188-C.